Fireplace maintenance is perhaps one of your more ‘tedious’ tasks during winter months. And, let’s be honest, the fireplace is also one of the most enjoyable parts of your home décor. Before you grab a sledgehammer and start knocking out brick walls and putting all your stuff in a storage facility, just know that simple fireplace maintenance can provide years of enjoyable nights when Jack Frost creeps up your window sills. 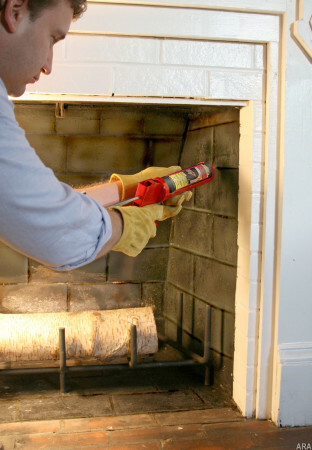 Fortifying your chimney with water sealant and fire prevention methods won’t necessarily prevent water from gaining entry into your chimneys and making life, hell. Professionals suggest getting chimney caps, which can help keep high winds and torrential rains from making their way down your flue and eventually into your home. Spark arresters catch those pesky sparks that tend to ‘pop’ from certain dry woods, people love burning. Without these protective measures, be prepared for potential fires in areas where they don’t belong. When correctly installed, spark preventers will help keep flames and accidental sparking contained. They are relatively inexpensive to boot. Mold and mildew can wreak havoc inside your fireplace since they’re both, a type of fungus that enjoys growing in wet and dark locations. Many people assume that mold is an extreme version of mildew, but they are actually the exact same thing and can be treated the same way. A lot of people deal with fireplace mold on a routine basis, so knowing how to control and prevent it can also be a worthwhile endeavor for you to take on within your home. Mixing solutions comprised of 4 parts water to one part bleach, some elbow grease and a wire brush will knock that problem out quickly; if the mold is too far out of sight, these brushes are available in what looks like a long kitchen broom. Make no mistake: mold, even in chimneys, can spread quickly throughout the house. If you’ve never dealt with mold remediation, you’d rather avoid it when possible for the mere reason that it’s costly. Your thicker woods may burn for hours, yet not completely burn into ash. After each week’s use, take your handy ShopVac or broom and dustpan, making sure the entire area is free of debris. Smolder any remaining hot embers by removing the source of oxygen from the fire (usually your flue or whatever is letting in oxygen) before removing larger wood pieces. You can always find hot embers by placing your hand at a safe distance from the ash bed and feeling for any residual warmth. Also, make sure the entire floor area, whether brick or tile, is completely cleaned as well to prevent ash from sticking to grout lines. Finally, clean glass fireplace doors using green (eco-friendly) products or anything nonflammable. Never assume that your fireplace is completely clean until a visual inspection dictates otherwise. Hate that blackened look you saw plastered on Mary Poppins’ clothing? You’ll quickly discover the same look after years of soot buildup. Purchase a circular metal chimney brush which is slightly longer than your flue, cleaning all areas where black is present. To remove soot and creosote from your fire pit area, purchase a wire brush similar to what you’d use to clean barbeque grills. Many have noticed an incredible difference when using six tablespoons of trisodium phosphate, one gallon of warm water and a dab of bleach, but make sure you’re comfortable mixing chemicals as this combination can be dangerous with too much TSP or not enough water. Consult with professionals if you’re unsure whether chemicals are suitable for your chimney. Fireplaces aren’t too bad, right? With frigid temperatures across most of America during the winter months, making sure your fireplace is cleaned and free of excess soot and debris is essential for proper wood burning. To assure proper operation and maximize warmth, you need to address dingy fireplaces which you’ve let slip out of control. Dingy fireplaces are an accident waiting to happen, both physically and financially. Unkempt chimneys can eventually emit mold, soot, creosote and even critters of the dark into your home; clean your fireplaces, flues and fire pit areas after each use, or at least weekly. Finally, give your fireplace one fantastic cleaning before closing things off for the springtime months to make maintenance in the forthcoming winter quicker.